With the feel of a five-star hotel, Optima Kierland apartments offer luxury living with a sustainable twist. David Hovey, Sr., founded Optima Inc. in 1978. 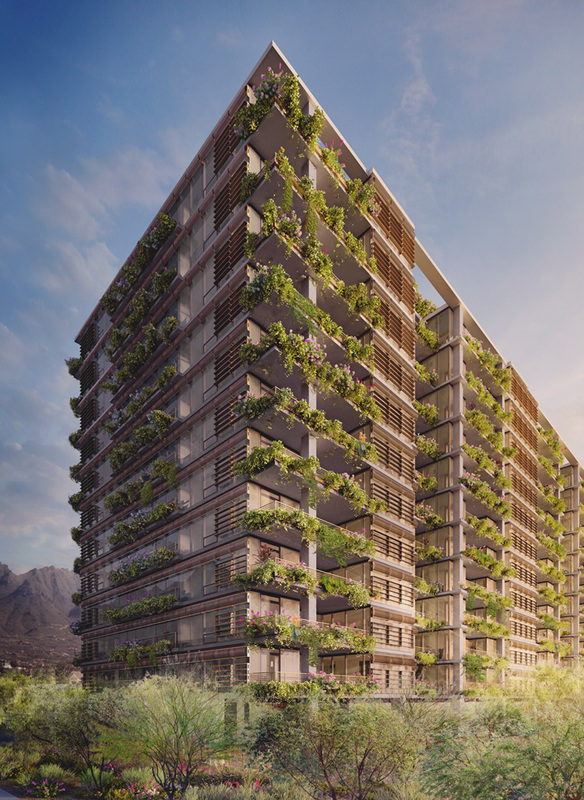 The company is known for its “upscale hanging garden style multifamily developments” in Scottsdale, Phoenix, Chicago and New Zealand, as well as rooftop gardens and vertical landscaping. The company designs, develops and constructs all of its properties. Optima works with Leadership in Energy and Environmental Design (LEED) certified architects, which means its architects are certified by the most widely used green building rating system in the world. The company is a forerunner in the green industry; “green thinking” and sustainability have informed its projects since the 1980s. The company has two locations in Old Town Scottsdale: Camelview and Sonoran Village. The newest project, Optima Kierland, is a series of four towers zoned to be either apartments or condominiums. “Right now, the first completed leasing tower has 10 stories and 155 units, and the condos will be one- to five-bedroom homes ranging in size from 720 to 4,550 square feet, with flexibility for combining units for larger homes,” said Holly Peterson, of Optima, Inc.
Keeping the business in the family, David Hovey, Jr., president of Optima and son of David Hovey, Sr., is the lead architect on the project. Hovey, Jr., graduated from Cornell University in 2001 and moved to Scottsdale to get his master’s degree in architecture. He started with the family business as a superintendent and project manager. Optima Kierland is the first International Green Construction Code (IGCC) project for the city of Phoenix. (Sonoran Village was the pilot project for the IGCC in Scottsdale.) The IGCC is the first model code to include a sustainability measure for an entire construction project site. The Camelview location is a certified LEED building, but they chose to use IGCC for Kierland because, “with the IGCC, we were able to go back and forth during the permit process and pick what we wanted,” said Hovey, Jr.
Optima Kierland will be constructed in two phases. “In Phase I, Optima Kierland includes a 12-story condominium tower with up to 220 residences, and a 10-story boutique leasing tower with 155 residences. Phase II is the 10-story apartment building,” said Peterson. The towers are 90 feet away from each other to offer a courtyard aesthetic to homeowners. The location of Optima Kierland is perfect for people with active lifestyles. The complex is located within walking distance of Kierland Commons and the Scottsdale Quarter. “You will have a really pedestrian-friendly open plan, which will be nice to look at when you’re driving by,” said Peterson. Aside from how pedestrian friendly the complex is, Optima Kierland’s strongest selling points are its amenities and construction typology, as the building is made of concrete rather than wood frame. The building offers a fully equipped gym, an area for dogs, a yoga studio (and teacher), an indoor basketball court, a personal trainer, a business center, an in-house masseuse, multiple saunas and a rooftop pool, to name a few. “Unlike our Camelview project and our Sonoran Village project, we have no residential units at grade level. We have amenities at grade level and amenities at roof level,” said Hovey, Jr. The plant boxes are not just easy on the eye; they function to lower the ambient temperature of the units. Each box is self-contained and hangs slightly over the edge of the building to create a shadow line and add to the aesthetic. First, the box is bolted into the concrete, then fertilizer and water lines come up through the walls and into the boxes to control how much each box is getting. The design came from Dr. Chris Martin of Arizona State University, who worked on 12 test beds in Glendale, Arizona. “We studied what plants would be the best for certain water conditions and certain sun conditions,” said Hovey, Jr. Light meters determined which plants worked best at each part of the building. Many of the plants that ended up in the boxes were native to Arizona or elsewhere in the Southwest. Sustainable building was a priority for Optima. The complex is made of technologically advanced materials that extend the building’s lifespan and ensure enduring quality.